Almost Heaven Barrel Sauna 6′ Review – Innovation at its best! No space requirement: One of the obvious and most significant benefits of an outdoor sauna is that it doesn’t need to be stored in your home, thus not blocking any space. Usually, indoor saunas may become a hassle to place as they block quite a lot of less. Also, if the room they are placed isn’t large enough, it may lose its spaciousness as well as the attractiveness, and seem like it’s rather filled with something huge. An outdoor sauna manages to get around all such problems, by being placed outside and not occupying any space in your home while still allowing you enjoy all the benefits of owning a sauna. Improves the look of the surroundings of your home: Given that you get a considerably modern looking outdoor sauna, it’s sure to improve the look of the surroundings of your home. Increases your home’s value: Getting an outdoor sauna helps your home look more attractive and lavish, thanks to the overall attractiveness of the surroundings increasing considerably. Now though finding a quality outdoor sauna may be a bit difficult, you surely won’t have to deal with a lot of trouble if you go with reputed sauna manufacturers who builds quality outdoor saunas like Almost heaven. 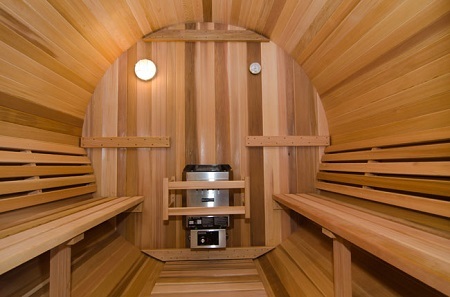 In fact, the saunas offered by Almost Heaven comes with their own unique set of features. After all, authenticity, durability, and customer satisfaction is what Almost heaven is known for. Innovation alone makes it stand out from the lot! The Almost heaven outdoor Barrel sauna is designed in such an innovative way, it would probably never fail to make your guests feel amazed about its design. The shape of this sauna is something that helps it stand out from all its counterparts. It looks pretty attractive, modern and lavish and hence sure to be a great addition to your home. This is another unique thing this sauna offers. Usually, saunas don’t offer you the option to go for a particular size. 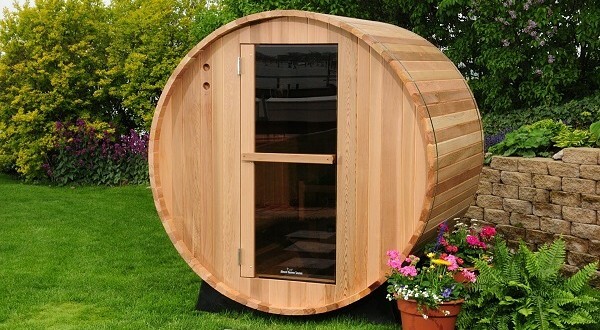 However, this sauna offers you to choose from a canopy barrel length according to your needs. You can choose one to fit as few as just 2 or as many as 6 people. This outdoor sauna ensures a perfect level of insulation and heat inside it and you are sure to get a relieving, relaxing feeling while resting in it. It’s also a great option for people who suffer from a particular type of pain to get some quality rest and relief. Summary : This outdoor sauna ensures a perfect level of insulation and heat inside it and you are sure to get a relieving, relaxing feeling while resting in it.